I individually hand cut, carve and finish quality original gemstones to give you unique, naturally forming beautiful gemstones for jewellery making. I like to work with the gemstones in a natural, freeforming way to enhance each stone unique qualities to ensure you have a truly individual, one off gemstone. Occasionally I am offered rare gemstones and I will make these available too. If you see a stone you would like made into a piece of jewellery please message me. We also make our own jewellery using my hand carved gemstones please feel free to take a look. 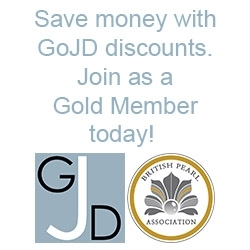 www.glitterandgem.co.uk I am offering a 10% discount on my services to subscribing Gold members of The Guild of Jewellery Designers. Please quote the discount code found in the 'Active Resources' section of your guild dashboard when logged in.